More than a decade ago the Bello sisters, Kenia and Odalys decided to combine their education and experience with their hard work ethic and offer it to the service of the very demanding and diverse real estate, land development and engineering/architectural design markets of South Florida. A company prepared to deliver outstanding service to its clients – both private sector and government entities. A company capable of handling projects of any size and complexity. A company where each job is prepared using cutting edge technology and in strict compliance with state and local regulations and standards. During the years we have grown along with our city and our clientele. We have evolved as our profession has. We have acquired new technology for field data collection and processing, and we have refined our staff. 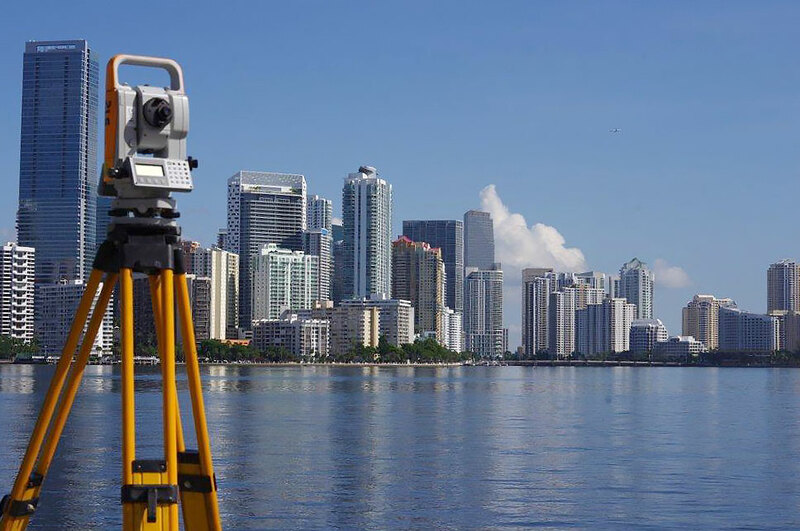 We have extended our services to a more comprehensive level, where each aspect of surveying is carefully mastered in order to fulfill and comply with the various needs at every stage of development. We will assist you in financing, design, permitting, construction, and occupancy as well as providing any mapping services you require. Initial boundary survey, topographic and tree survey, the plat or replat, construction steps and even further, the expert witness services in boundary disputes and area litigations in high end condominium properties. We do it all. We have been honored to work with a highly prestigious clientele that includes Zoning/Land Use and Real Estate Attorneys, Engineering Consultants, Architects, Contractors and Land Developers. We feel very proud to consider ourselves part of the shape of the new Miami – as we are currently involved in underground utility work for mega projects such as the Brickell City Center by the Swire Company, the Downtown Doral by Codina, the Miami Skyrise by Berkowitz, the Pearl at Dadeland by Morgan Group and the new Jackson Health Systems complex at Doral. We are highly rated, with a long history of excellent, accurate surveys produced with the latest technology. We are industry experts. Benefiting from the experience and educational background of our Directors and qualified staff, we manage to never sacrifice quality and accuracy and yet still offer very competitive prices. 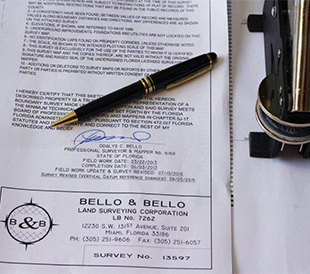 No worries about the quality of our product: Bello & Bello is your one stop place for surveying services. A high level of professionalism and care is applied to all of our survey maps, sketches, images and reports. Our products are generated on electronic media and fully compatible with the technology used by architects, design engineers and building contractors. Our comprehensive services are tailored to fit the demands of our clients and fulfill the needs of the end user of the survey work being provided. From field to office, our work is fully insured and performed meeting and/or exceeding the minimum standards of practice set forth by the Board of Land Surveyors and Mappers. We are on top of technological advances in our field and are always on the cutting edge of equipment and techniques. We keep ourselves informed and are able to re-tune our services to meet new standards and new requirements. We keep records of all our work; therefore we can be called tomorrow or years from now for updated surveys or extended services. If we initially survey a vacant parcel for a real estate transaction, the new owner can call us at a later date for the additional services needed for rezone, design, subdivide and permit. We can also provide the following construction survey services: lay-out new structures and utilities, set elevations, provide certified documents for partial inspections, prepare As-Builts and Finals and assist you all the way up in the process until obtaining CO (Certificate of Occupancy) - whether the project consists of a new single house or a big residential or commercial complex with utility and infrastructure work. Our proven reputation of successfully completed projects and satisfied clients says it ALL. 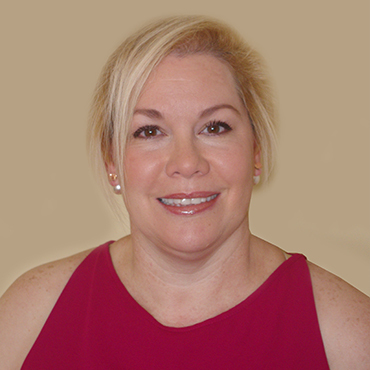 Odalys has more than 20 years of broad ranging experience – public and private –in the many phases of land surveying, boundary law, underground utilities (water and sewer systems), land development, land planning/platting and flood plain management.She has worked all over Florida, from Orlando to Key West, from the East to the Gulf coasts. During her career, she had supervised and directed more than 60,000 Boundary Surveys of residential and commercial parcels which include: ALTAs, topographics, As-Builts, Route Surveys, multi-residential plats and condominiums, all prepared in compliance with local and State regulations, Board requirements and Minimum Technical Standards. Odalys is one of the founding partners of our company. From 2009 to 2015 she stepped out to work with the Miami-Dade Water and Sewer Department (WASD) as the Manager of the Right of Way and Damage Prevention Section, New Customer Division f.k.a. the Utility Development Division. At WASD, she was responsible for the review and acceptance of water and sewer, including public Pump Station As-Builts, for the analysis and resolution of utility conflicts and for the legal/technical review and approval of the grant of more than 500 utility easements. Ms. Bello also supervised statutory responses to Sunshine State One Call of Florida (SSOCOF) locate tickets which required the coordination of the subsurface location of water and sewer pipelines in strict compliance with the Underground Facility Damage Prevention and Safety Act, Part IV, Chapter 553, Florida Statutes. At WASD she was also responsible for the successful conveyance of major Public - Private partnership projects such as the Marlins Stadium, FIU expansion, Miami-Intermodal Center, Port of Miami Tunnel and Government Cut Water Main relocation that included dealing with the United States Bureau of Land Management for securing WASD easement rights over the navigable waters of Biscayne Bay. An extensive knowledge of surveying principles and boundary laws combined with her seasoned experience in land records examination, legal description/deed interpretation and field evidence assessment make her a highly qualified consultant in land title matters and give her a unique approach to our projects, where technical and legal title aspects are always kept in mind for successful completion. 1991 - Engineer Geodesist (Photogrammetrist) – Bachelor’s Degree in Land Surveying and Mapping - Master of Science in Engineering, Siberian State Academy of Geodesy, Novosibirsk, Russia. 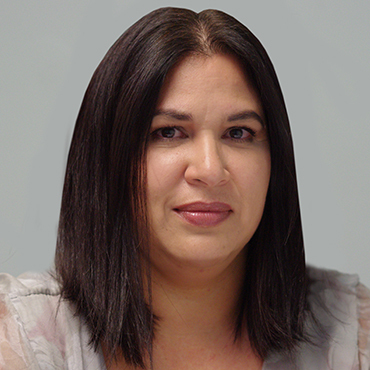 Kenia has more than 20 years of broad ranging experience in the field of land surveying and mapping: from field work to office drafting, calculation and map preparation, basic survey measurements to advanced LIDAR and GIS technologies, and hand drafting to 3D and digital modeling, Kenia has excelled at it all. Kenia primarily handles our Flood Plain issues: the precise determination of questionable Flood Zone boundaries combining FIR Maps and aerial images; the evaluation of terrain and structure conditions to determine the feasibility of obtaining LOMAs, LOMRs and elevation variances for post FIRM structures; the preparation and completion of Elevation Certificates in compliance with FEMA instructions and with the constantly changing requirements established by the building officials/agents of the CRS participating communities. Kenia is a true expert in construction lay-out and survey construction work. She supervises the precise stake out of buildings and infrastructure, where the strict observance of design criteria is key for the operability and functionality of drainage, water and sewer systems. Ms. Bello has a passion for technology. She is responsible for the acquisition of new equipment and software as well as its implementation and combination to increase productivity and accuracy. Her educational background in electronics, paired with her field experience, strong analytical skills and keen mind make her highly competent in solving geodata conversion issues and in sharply selecting the appropriate cost-effective technology for each project in order to achieve the required accuracy and to produce the correct mapping product. Her creativity and rigor applied to our processes continue to produce outstanding results.